RCN member, Eric Chester, has just returned from a trip to Greece, where he spoke to members of SYRIZA and ANTARSYA. Here is Eric’s report. During a recent visit to Greece, I was able to get some sense of the enormous problems confronting that country. Greeks are very proud of their past, not only the legendary era 2500 years ago, the time of the Parthenon, but more recently when Greeks fought the Nazi invaders. Nevertheless, along with the national pride is a bitter sense of despair, a feeling that there is no way out of the current catastrophe. The number of suicides has been increasing rapidly, as young Greeks try to cope with massive unemployment and the disintegration of the educational system, along with clear indications that the crisis will only grow worse. Walking along the streets of Athens I saw people living on the street everywhere, children begging, sidewalks crumbling, and riot cops ready to come down on the next demonstration. Greece is a poor country, perhaps comparable to Mexico in economic development. Furthermore, global warming has hit Greece with a vengeance. Temperatures climbed to over 40 degrees every day, and the stagnant, humid, polluted air was oppressive. Heat wave of this sort can last for weeks. Of course, the most acute problem is the national debt. Greece owes huge sums, mostly to foreign banks and to EU countries. Interest rates on government bonds have soared since few investors believe Greece can fully repay its debt. During the recent election campaign, the mainstream parties promised to renegotiate the debt, to extend the period of payments. Since then, the European Union has made it clear that there will be no negotiations. Greece pays the debt as promised, or it will be ousted from the Eurozone. The conservative government currently in power is preparing a new round of cuts that will cause a further drop in output, and a further increase in unemployment. To say that the situation is grim would be to greatly understate the depth of the crisis. There is every likelihood that, in the end, Greece will be forced to leave the Eurozone. Once it does so, it will have to repudiate a significant part of its national debt. The critical question is how this exit from the EU will be handled. Leaving the EU will be wrenching, bringing with it a major shift in the Greek economy, and further hardships. No one is willing to take this step, and instead the crisis deepens and the economy spirals downward. The only bright spot in this mess is the rise of the Left. While I was in Athens, the streets were quiet. Apparently, everyone was waiting the next round of cuts in social services and the fire sale of state owned businesses, including oil and gas properties. The dominant force on the Greek Left is SYRIZA. Initially formed as a coalition of left-wing groups that came together to contest elections, the organization’s leaders are now ready to move from a coalition to a unified political party. Although there are Trotskyist and Maoist groupings within SYRIZA, the controlling groups are Eurocommunist in background. Alex Tsipiris, SYRIZA’s public face, is the leader of the strongest of the Eurocommunist component groups, Synaspismos. After its recent relative success in the elections, coming in second, SYRIZA realizes that it must provide more than a parliamentary opposition to the current conservative government. SYRIZA has begun to mobilize its activist base to participate in neighbourhood based organizations targeting a specific issue. For instance, one of these social movements restores electricity to the many who can no longer afford to pay the bill. This shift toward the neighbourhood social movements would seem to be a good idea, but there are concerns that SYRIZA will attempt to take over these movements, and use them for its own narrow organizational interests. The next elections are scheduled for four years from now, but few expect the current conservative government to last that long. Instead, there is a general expectation that there will be an “explosion” sometime soon in Greece, as the government attempts to push through another round of cuts. The government will then fall and, perhaps, SYRIZA will come to power. After that, the scenario becomes murky. SYRIZA hopes to avoid leaving the Eurozone, but is not willing to push through the cuts demanded by the troika composed of the European Central Bank, the European Commission and the International Monetary Fund. It would seem that SYRIZA’s leaders have done little to envision an alternative path, although it is clear that there are hopes that, somehow, a new government could restore the social welfare state that existed prior to the crisis. To the Left of SYRIZA stands ANTARSYA, a coalition of radical socialist organizations coming from a variety of backgrounds. ANTARSYA has a brief history and seems to be a work in progress. I attended an Athens wide meeting of the coalition with about 75 activists, most of them young. The debate was vigorous, but the speeches went on too long. I also met with a comrade from ANTARSYA prior to the meeting. We had a good discussion and agreed on the need for greater international solidarity. He emphasized that ANTARSYA called for an immediate exit from the Eurozone and the total repudiation of the debt, positions which put it in direct conflict with SYRIZA. This certainly made more sense than the position taken by SYRIZA, and yet there was a considerable haziness as to what would happen after Greece left the Eurozone. Would Greece move immediately toward a socialist transformation? If not, what would happen? The idea that socialism can not flourish in one country is an immediate reality in Greece. Greece is too poor and too small to survive as a democratic socialist society for more than a brief period. Unless the revolution spread quickly, there would be a successful counter-revolution, or a leadership group would crystallize and an authoritarian regime the likes of Cuba would result. As an anti-authoritarian socialist, the political perspective of ANTARSYA seemed far more compatible than that of SYRIZA. We should try to develop closer relations with ANTARSYA, exchanging documents and developing joint projects. Firstly, I don’t think it is possible to approach an exit from the Eurozone as if it was a consumer choice like choosing between different kinds of washing powder off a supermarket shelf. In many ways, it will be a choice that external circumstances impose on the Greek people. Put simply, it is a relationship of strength between different forces. 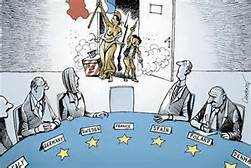 If it becomes necessary to break with the Euro, then it must be understood by workers, peasants, students and all other concerned Greek people that no other option existed. The isolation of a separate country with a currency that has little convertibility alongside an inability to obtain external loans may become the best option but it will not be an easy one. All this requires that a process of popular education and preparation take place. It also requires that judgements on the conditions involved in making that leap be established and timing correctly assessed.Congratulations on a fascinating report. But two points. Secondly, as an “anti-authoritarian socialist” you are entitled to your views, but the Greek people may not have that great a range of options available. Try to imagine what could happen if the Greek people “opt-out” of the Euro and repudiate the debt. The creditors will not drop their demands for debt repayments. Moreover, they will still be denominated in Euros so that even if the new currency attempts to escape by devaluation, the debts will increase. Greece will be placed under an economic embargo that could make the purchase of many types of goods impossible, especially hi-tech equipment, even if they can find someone to sell them. 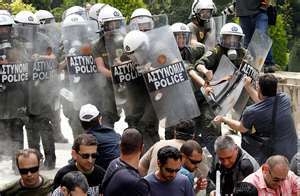 Companies and individuals trading with Greece will face enormous fines and possibly their assets seized. Ships and aircraft from companies trading with Cuba already face that danger. All politics is about the wisest possible use of authority and power. That is even true for the exercise of working class power. That’s what separates it from moralising. All decisions have consequences. There is no such thing as a risk-free decision. I suspect there are a lot of political works-in-progress currently being made in Greece; the lining up of forces for coming conflicts is only beginning.